What is Bootstrap and why we should use it? Bootstrap is a front-end framework that has been developed to help create dynamic websites and web applications. Bootstrap based HTML templates design for typography, forms, buttons, navigation and many other. It supports all major browsers. It is fast loading and responsive for all devices. 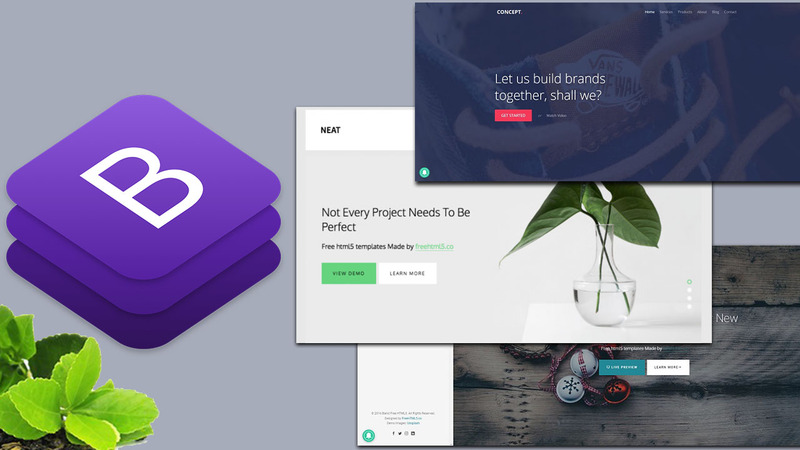 Neat is a free html5 bootstrap website template perfect for an agency, portfolio and freelancer websites. The features are jquery counter, animation, hero slider and many more. Created with latest technology like HTML5, CSS3, jQuery, and SAS The SCSS file has been included for easy to customize. Marble is a free HTML5 bootstrap based template with a clean and minimal design. Ideal for a portfolio or any other type of website that you use it. It has fixed left sidebar menu with an off-canvas menu on mobile. When you scroll through the pages, show off your outstanding works professionally with smooth animation. Along with this, share your amazing stories with beautifully designed blog designs of this marble template. Elate is a page free HTML5 bootstrap template portfolio for freelancers, designers, developers, and even agencies. There is a smooth parallax and animation effect on sections. Packed with 4 ready to use styles too. Download and share now! Lattes: Bootstrap HTML template for small businesses, creatives, and agencies. Lattes is a bootstrap based multipurpose template with modern and clean elements, using plenty of white space to put most of the focus on your content. Responsive design works as wonder because all the modules are transferred if a customer is viewing your content on a mobile device. Lattes are extremely developer friendly and easily modifiable, with an extensively commented, thoroughly documented coding that is responsive and cross-compatible with all devices, browsers, and platforms. Lattes incorporate all the impressive HTML5, CSS3 and Bootstrap elements necessary to allow web developers to generate modern and seamless one-page websites without ever having to write a single line of code. The concept is a free html5 bootstrap template perfect for business or corporate websites. This free template was provided by our friends at GetTemplates.co. and was created. Packed with lots of features. Checkout the demo, download, and share!